Mama Plover sitting in and checking out Papa Plover’s perfect little nest scrape. My friend Lauren Mercadante from Manchester stopped by today to volunteer with the Piping Plovers and we added twenty signs on the posts surrounding the roped off area at boardwalk #3. We had a new group of Piping Plover travelers fly in overnight, earlier in the week, but since that one-day stopover, where they rested and foraged at the nesting area around boardwalk #1, the travelers have not since been seen. If we see evidence of PiPl tracks at #1, we can add more signs there, too. There has been tremendous criticism regarding signage. The signs that Greenbelt posted at Good Harbor Beach are similar in size and scope of information to signs used up and down the East Coast, and on the West Coast, too, for Snowy Plovers, a similarly threatened species. I especially like the first one and the second sign in the gallery and would like to design one for our Good Harbor Beach similar to one of these. Kind folks have suggested adding banners to the posts, which I am afraid would only serve to attract gulls and crows, and would also disturb the PiPl. More kind folks have suggested fencing. I think that conservationists don’t use dune fencing for several reason. The adults (and chicks) need to run freely to and from the water’s edge to forage, the fencing would be disruptive to install, in our case, part of the fencing would need to be in the tidal zone and would easily be damaged during high tides, and because it would trap small predatory mammals within. Regardless of whether or not we have adequate signs, we find ourselves in the struggle of Dog Owner versus Piping Plover. It’s partly because the Plovers have arrived a full month earlier than in previous years. In 2016 and 2017, they arrived at Good Harbor Beach when the beaches are closed to dogs for the season, on May 15th, and May 3rd, respectively. This year, the PiPl arrived on April 3rd. I know this for certain because this spring I had been checking everyday since mid-March. There are many, many dog owners who are keeping their dogs leashed when at Good Harbor Beach and many who are walking their dogs at alternative locations during this last week in April. We should all be grateful and appreciative to these friends of the PiPl, I know I sure am! The struggle of Dog Owner versus Plover is not simply an issue at this time of year, with dogs off leash during the month of April, but is consistently challenging throughout the summer during the entire nesting season. Yes, there are folks from out of town who aren’t familiar with our no dogs on the beach between May 1st through October 1st ordinance, but the folks who most frequently ignore our ordinances are people who live here and are aware of the rules. This is especially apparent in the early hours of the morning and after five, when people know there are few enforcers on duty at those times of day. Another threat to Piping Plovers, again created by humans, are people that leave their trash on the beach. Good Harbor Beach looks pristine and incredibly beautiful after the tremendous job done by the Clean City Commission’s Great Gloucester Cleanup volunteers. Daily there are typically only a handful of crows and gulls. Soon that will change. People will leave their trash on the beach, which attracts a plethora of hungry gulls and crows, which eat baby chicks. 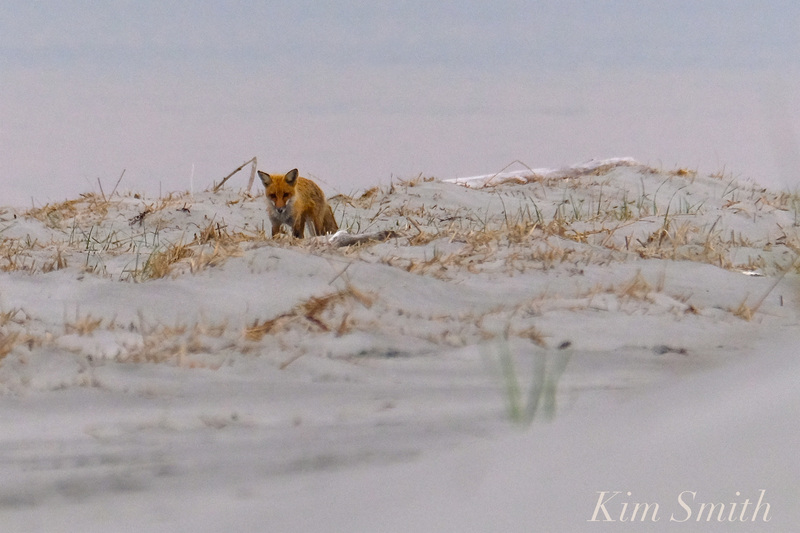 Piping Plovers face many other threats including fox and coyotes that forage on eggs, large predatory birds such as Great Horned Owls, plastic pollution, loss of habitat, and rising sea level. But the two threats that are under our immediate ability to manage are preventing dogs and people from disturbing the nesting sites, and keeping the beaches super clean of trash. 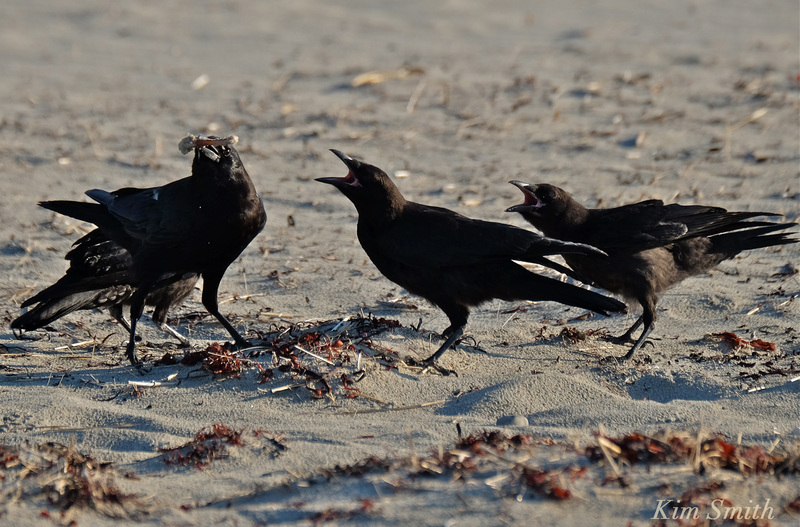 Crows in the PiPl nesting area, fighting over chicken bones left on the beach, 2017. Many North Shore beaches that find themselves home to the Piping Plovers are also under the management of federal and state organizations. Plum Island is a US Fish and Wildlife Refuge, Nahant and Revere Beaches are managed by DCR, and Crane Beach is managed by the Trustees of Reservations. Gloucester has none of the daily oversight and funds provided by federal and state organizations. 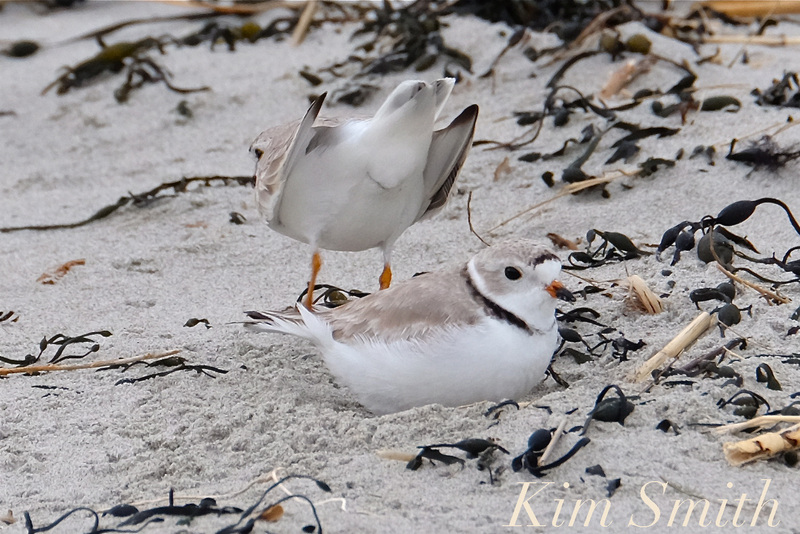 The Piping Plovers need our help and so it is up to we citizens of Gloucester and Cape Ann to do all we can. Piping Plovers are facing extinction. There are approximately only one thousand five hundred breeding pairs in the world, and that simply isn’t enough to sustain the population, especially since the rate of fledging has recently dropped precipitously. Conservationists hope to raise the number to at least two thousand five hundred pairs, and the bird will not be taken off the threatened species list until that time. The early arrival of the Piping Plover this year signals a success of sorts. The pair successfully fledged one chick last summer, which is better than the current overall Massachusetts state average of .6. The birds are maturing and finding their way more easily to GHB. This year, there simply wasn’t enough time to change the dog ordinances, which as they are currently written, allow dogs off leash fifteen days out of the month of April. Because the leash ordinances at this time allow dogs off leash, the only way we are going to help the Plovers is if we work together as a community, to help each other understand what is happening with the PiPl, and do all we can to protect this tiniest of shorebirds on the busiest of our beaches. 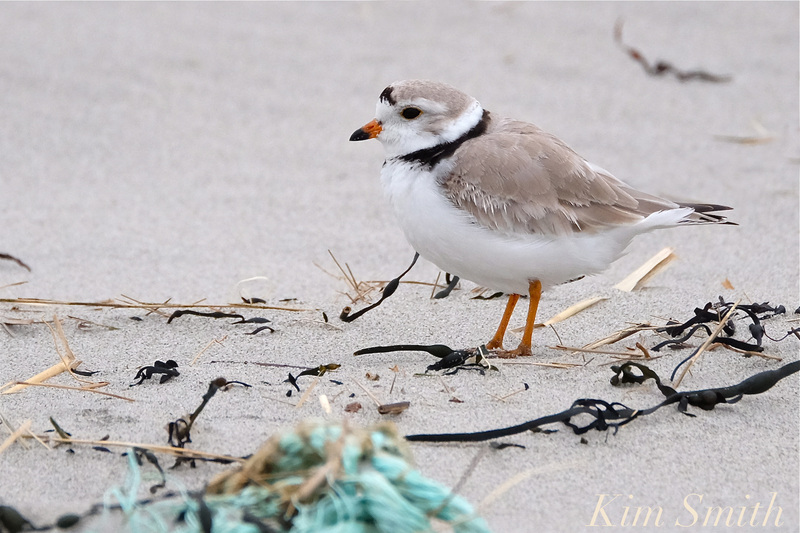 This entry was posted in Birds, Birds of New England, Cape Ann Wildlife, Good Harbor Beach, Piping Plover and tagged Beautiful Birds of Cape Ann, Charadrius melodus, Dog vs Plover, Good Harbor Beach, how you can help piping plovers, observing Piping Plovers, Piping Plover, Piping Plover male, Piping Plover nest, Piping Plover signs, Snowy Plover signs, tips for piping plovers on April 26, 2018 by Kim Smith.